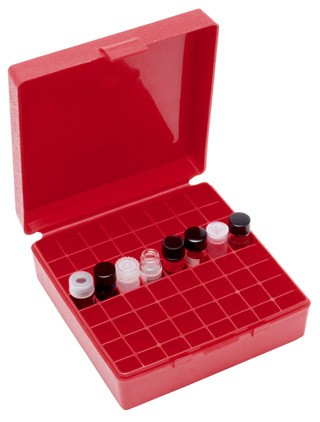 Hinged vial storage boxes made of premium grade polypropylene. A locking clasp helps to keep most samples in place if tipped over. Autoclavable. Holds 64 vials. Accommodates 4mL(15 x 45mm) vials and most 1 Dram glass vials. Tall caps or plugs will not fit. Some plastic 1 Dram vials fit tight. 15.2 x 47.6 mm maximum vial size. Box measures 5.6 x 6.0 x 2.1 inches.